You look at the clock and realize you must be at work in one hour. Do you know where you’re going and what you need? When you’re a sports photographer, your location and equipment change with each job. The size of the job matters too. Do you have enough photographers and staff scheduled to get all the athletes’ photos finished before time runs out? How can you be sure? If you’re a TSS Photography franchisee, you’ll have the perfect solution for all your scheduling needs. The Quick Event Management System (QEMS) available to you as part of your contract handles all the details. From cataloging customer information to scheduling photo shoots and photographers, this one tool does it all. Once you’ve decided to use QEMS, adding data is simple. The forms are self-explanatory and creating a log-in for everyone you employ is a breeze. The tabs along the top allow users to navigate the system in a way with which most are already familiar. There is a place to input all your company’s records and share information throughout the organization. Create employee profiles, then log in and find contact information for everyone at a moment’s notice. You can control what kind of access each person has, which then dictates which parts of the system employees have access to and what information they are able to edit within the system. Customer profiles allow access notes and information pertinent to any project. The messages tab allows you to create messages that reach everyone who logs in. 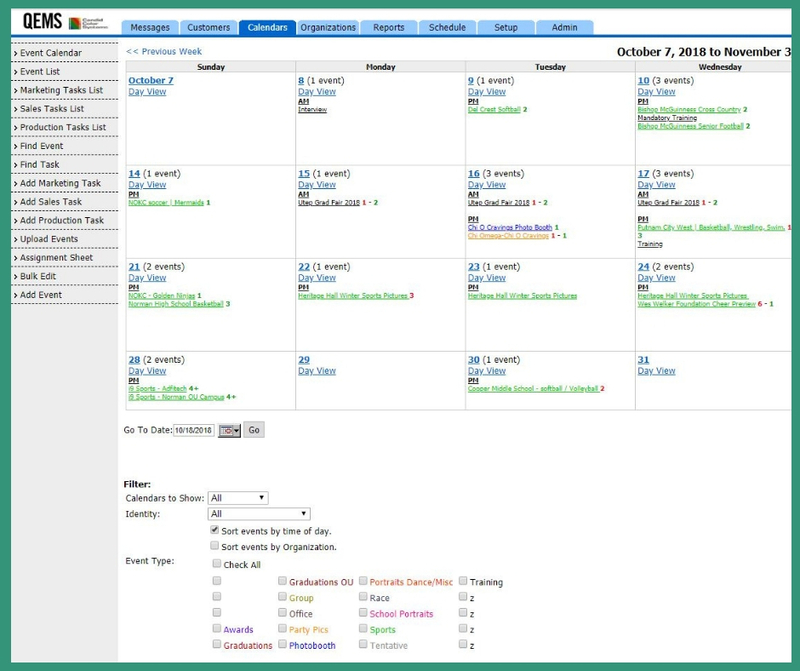 Check out this example of what the calendar view looks like for a typical month in the QEMS system. You can schedule any event you plan for your sports and event photography business in QEMS. In fact, when you create an event, you are able to select the category in which it falls, which then renders it a specific color. Which means at any given time, your event calendar is color coded. Additionally, you can search events by category or create specific calendar views based on event categories to help you plan schedules. To view any event within the calendar view, you simply click the event name located on the correct date and the event listing will pop open in a window. Using the combination of the Control Key and the F key will let you search for keywords and will pull up corresponding events. 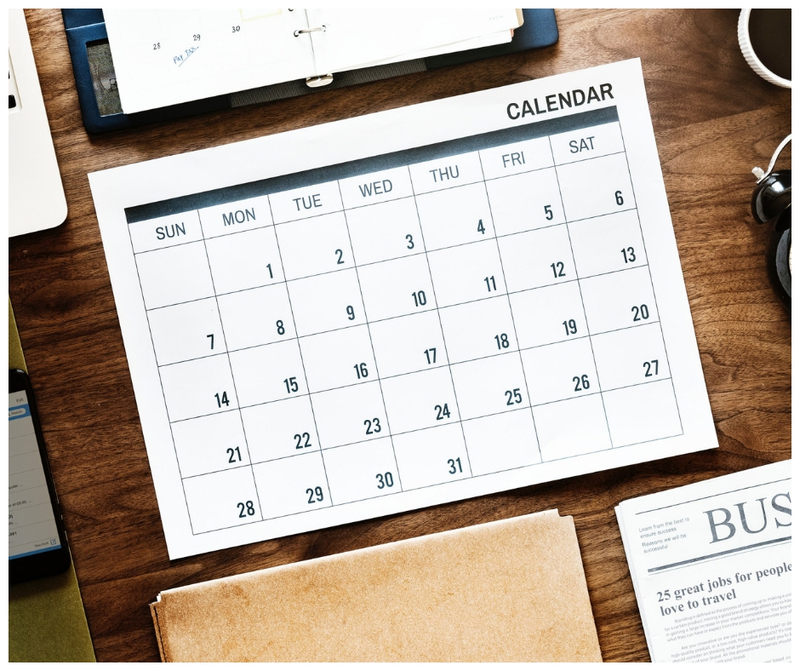 Not only can you view the entire calendar, event categories, and specific events, you can use QEMS to schedule specific photographers for specific photo shoots. Since QEMS is a smart system, your staff profiles allow you to fill in the types of events with which your photographers work. You can then schedule people to attend certain jobs, and they are able to accept or decline those jobs. With one glance, you can see who has responded, which photographers are able to work on a project, and how many people you still need. Also, QEMS hosts everyone’s Google calendar information and anytime someone accepts an assignment, QEMS adds it to the teammate’s Google calendar. When your photographers and staff are packing and prepping for a job, all the information they need is housed within QEMS. Does the basketball team they are shooting wear green uniforms? They probably should pack a blue screen instead of a green one for a virtual shoot then! The correct address, who to contact upon arrival, and any special sales information can be loaded into the system for your employees’ one-stop preparation before leaving for a job. In the above collage, you can see several types of screens for different functions. 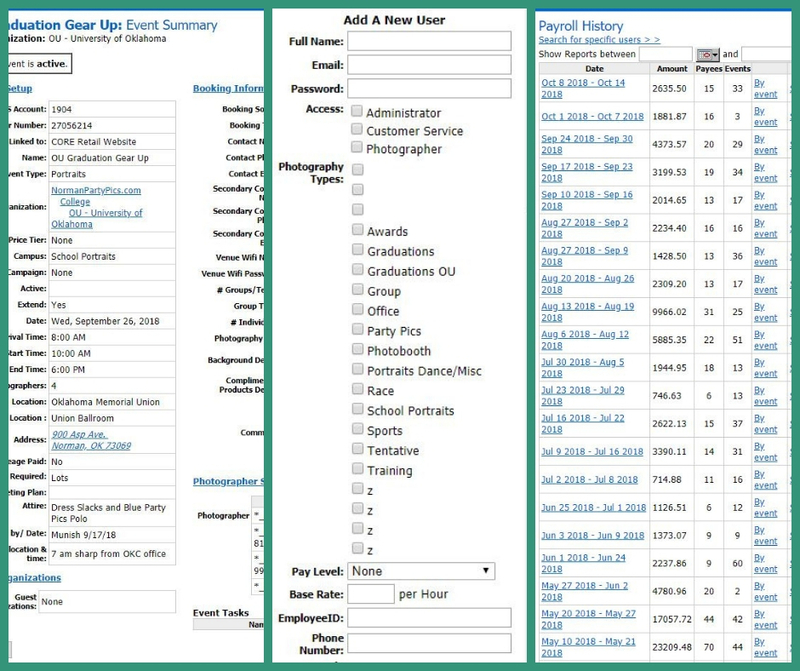 On the right is a partial event summary screen, in the middle is the new user form, and the left shows the payroll history report screen. At each event, photographers and staff check in and out through QEMS. This shows how many hours they were there working. If you’ve set up each employee’s user profile with their individual pay rates, you can easily see how much you owe them at the end of each job. Depending on how big or small your TSS Photography franchise is, you may write your own checks or you may have an accounting person who handles the tasks of paying people. No matter who is writing the actual checks, QEMS can run the report for you. When you go to the reports tab and select a specific period – whatever your desired pay period is – you run the report and see each person’s time, rate, hours worked, and the overall amount you owe them. When it’s time to do your record keeping, you can run other reports for overall hours or overall payroll to help you keep track. If you’re still wondering if QEMS is as good as we say it is, check out what TSS Photography franchisee Tod Cohen and his staff think about it. Don’t wait any longer to see if a franchise opportunity with TSS Photography is right for you. Download our virtual brochure today to learn more about the company who rewards their top franchisees with vacations and are ranked among the top franchises by Franchise Business Review.